As an update to our office transformation earlier this week, we mentioned ordering a fiddle leaf fig tree to complete the greener elements of the new space — and it's finally here! 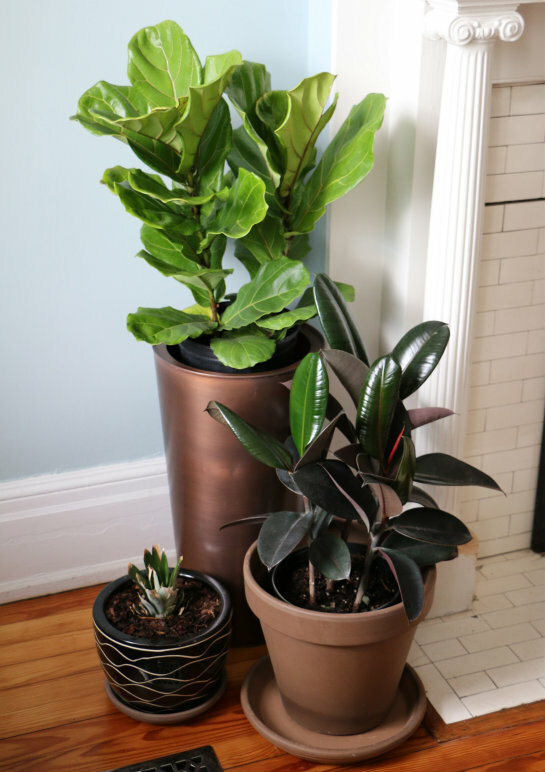 We've wanted some larger indoor plants and after studying the best types of trees for indoors, we liked the look of both the rubber plant and fiddle leaf fig. We had no trouble finding the rubber plant at our nearby Lowe's garden center. 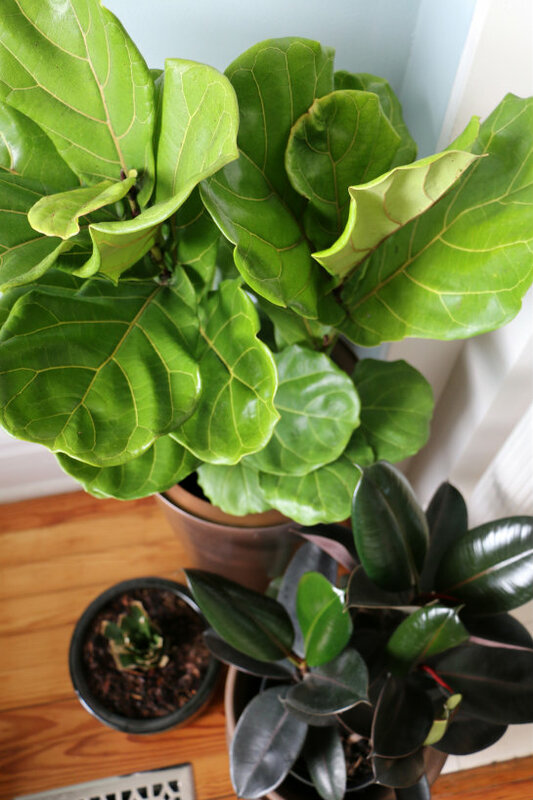 These "rubber plants" are also properly named "burgundy ficus elastica," so asking or searching for that name might help with the hunt if you're looking for one too. 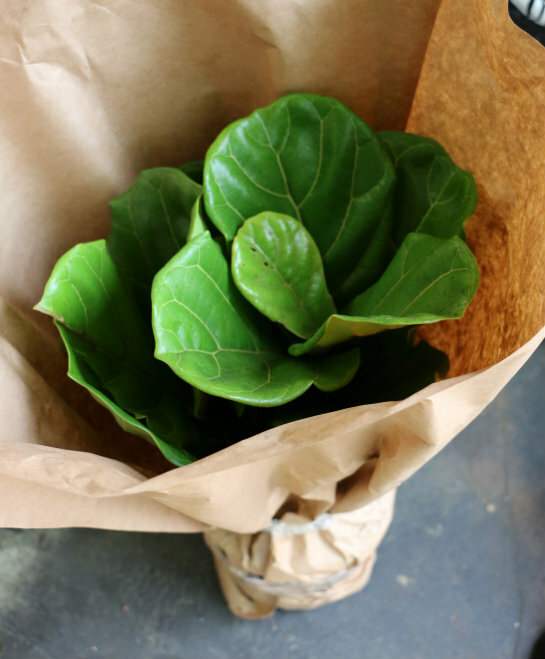 The fiddle leaf fig tree proved to be a bit more elusive to find here locally, outside of mature trees we saw at Home Depot that were a bit past our budget for a plant that's rumored to be temperamental. 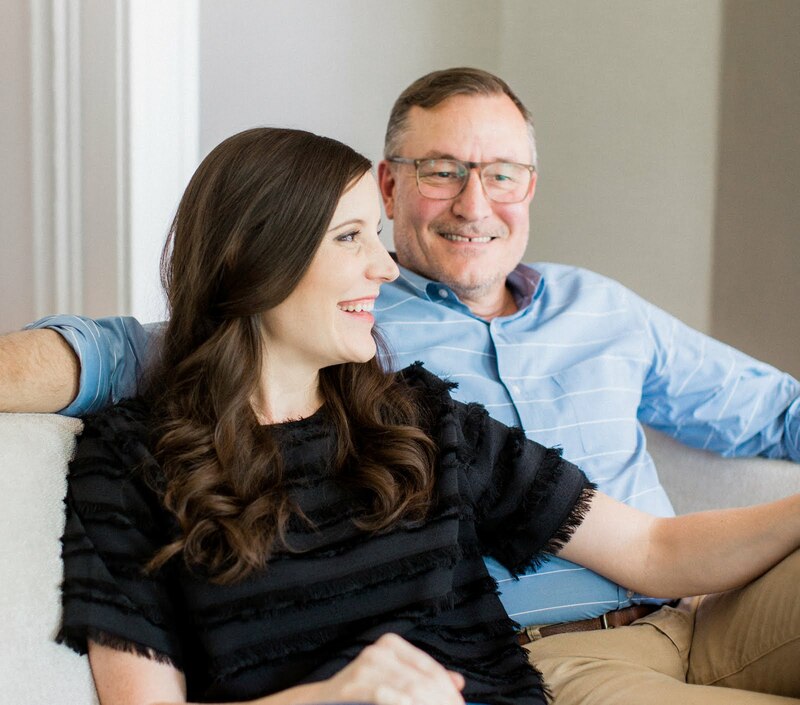 That's when we took to the internet and found a host of information from where to buy smaller versions, tips for care and growth and success stories from other people who've tried the same. 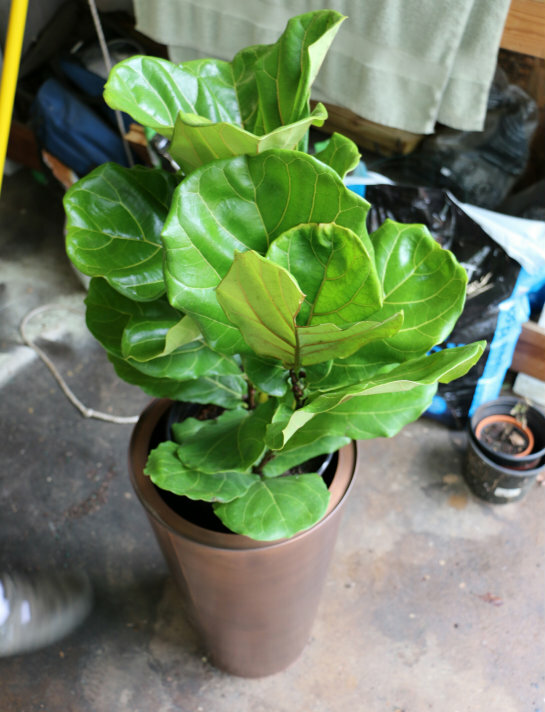 Laura's post all about finding her fig tree online and it's progress were encouraging, but after reading the success that Cheryl had growing a starter plant and the ability to propagate it, we were sold! 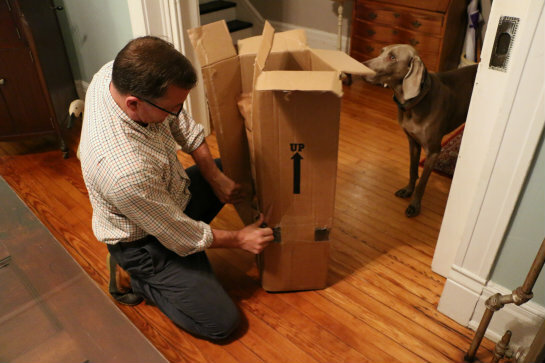 After our own search, we opted for a budget-friendly solution, ordering a smaller version for $17 online. Our hopes are that we'll be able to tend to the smaller version, allowing it to grow taller overtime. 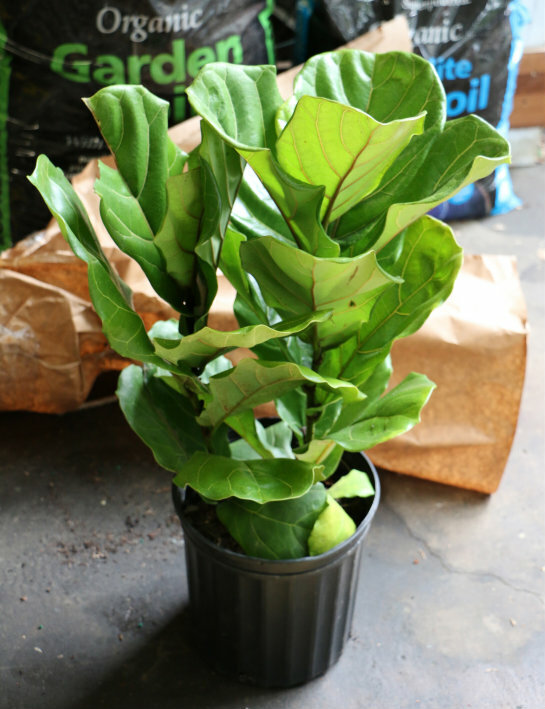 Similar to the rubber tree, you might have better luck with searching for the proper plant names "ficus pandurata," or "ficus lyrata" when looking for a fiddle leaf fig of your own. Bright, indirect light is best — lots of bright light, but no physical sun beams on the plant. Water the tree only when surface soil is dry. Wipe dust from the leaves to keep the plant healthy and able to absorb the most light. Fertilize once a month throughout spring and summer when plant shows the most active growth. Prune top leaves at stem during growing season to promote bushier, branched growth instead of a single stem. 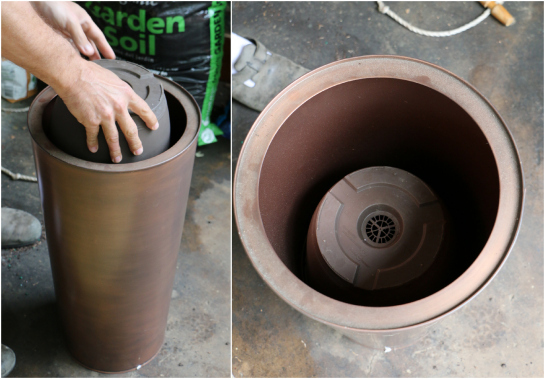 Re-pot the tree in a one-sized up container when roots begin to grow from current pot, or trim rootball, no more than 20 percent. Down the pike, a fruiting citrus tree could be a lot of fun to add in with our indoor mix of plants, but as you can see we've got plenty on our plates to take care of with these guys for now. We'll keep you posted on the progress of our new tree and its green office companions. Tips for success and from your own indoor tree experiences are welcome! How is this little guy doing? I'm interested in one for my room and would love to know if he's thriving! 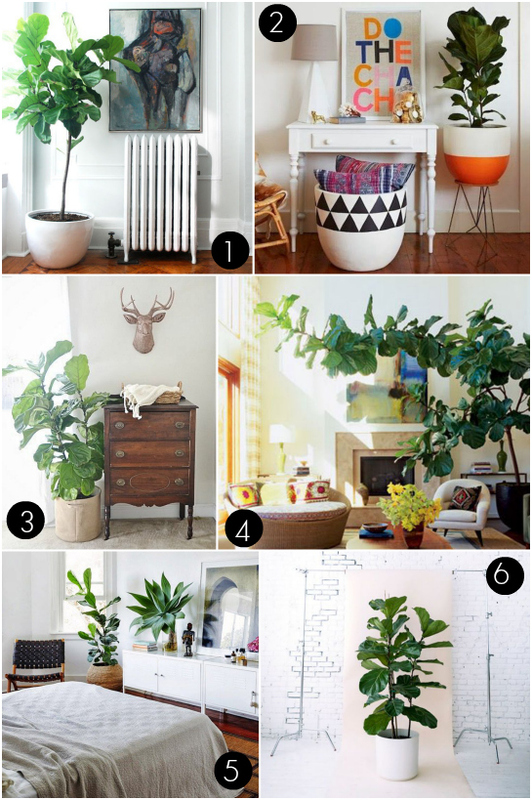 So, how's the fiddle leaf fig doing now? It is doing really well although now that we look back it is definitely taller and leaves are not quite as green or plentiful. Overall, healthy and growing! Thanks for checking in.